My name is Parker Nevicato and I am from Grand Blanc, Michigan. In the fall of 2014 I will be starting my junior year at Grand Blanc High School. I currently play for the Michigan Warriors U16 AAA. I have been sponsored by the Kris Perani Hockey Foundation for 6 years now and it has meant a lot to me and my family. The foundation helped assist my family after my parents were divorced and during the two times my mom battled cancer. The Kris Perani Hockey Foundation makes it possible for kids from any background to play the greatest game in the world. My favorite team is the Philadelphia Flyers and my favorite individual player is Ryan Miller. I would have to say my favorite brands of equipment would be Vaughn and Reebok. My interest in hockey began when I was around 5 years old. My dad and I went to open skate at the Polar Palace in Lapeer and I fell in love with the ice instantly. I was on my first hockey team at the age of 7, playing for the Lapeer Thunder. I was 8 years old when my coach, Brian Rousseau, asked if I wanted to play in net. I was leery at first but my first game as goaltender was a huge eye opener for me; I was able to see the game in a whole new perspective- it was an amazing experience. 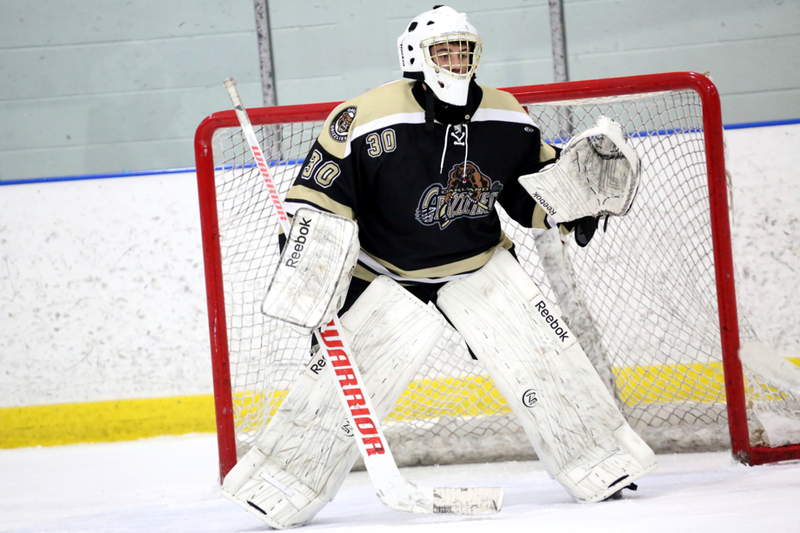 Over the last 8 years as goaltender, I have been a part of many great teams and organizations, but the season of 2013-2014 with the Oakland Jr. Grizzlies was an unforgettable year of hockey. We started the season off great; we rolled through our first showcase in St. Louis with only 1 loss out of our 5 games and it seemed like nothing could hold us back, but after a while we started to head off track. We weren’t competing the way we needed to and we weren’t winning the games we were supposed to be winning. Team meeting after team meeting, things were continuously the same. Then we had the International Silver Sticks Tournament in Newmarket, Ontario. During the 4 day tournament, my team came together unlike anything I have ever seen, and we took home the hardware after a 2-1 win in overtime in the championship. From that moment on, we started to see the outcomes we were looking for. After winning the state championship, the national tournament was the only thing on our minds for the next 2 months; we did everything together as a team and stayed focused. During the national tournament, we played some of the best hockey we have ever played. It took everything we had: the forwards blocking shots, the defense taking the hit to make the play, and the goalies staying mentally focused throughout the whole week. Once we all played our best hockey, we came home with a national championship. I have won many awards such as 3 MVP’s, 20 tournament championships and a state championship, but the greatest of them all is a national championship and it wouldn’t be possible without the other 19 guys on my team and our coaches. My future plans for hockey are to continue improving my performance over the next couple of years and then play Division 1 college hockey. My future goals in life are to major in business at a university, work in a big city, help donate and work with charities, and eventually buy my own Lamborghini. Hockey has done a lot more then help me become a better athlete, it has taught me leadership, how to work with a team, and most of all how to keep trying even after you have fallen over and over again.